The Common Holly tree (Ilex aquifolium) is a well-known tree with the multiple benefits of providing evergreen winter colour and quantities of attractive red berries. This tree does well in most locations, especially suited to windy, exposed locations. Planted at a spacing of 0.6m (2ft) between trees, this holly makes for an attractive, evergreen, prickly hedge. A small tree, therefore expect a height of up to 4 metres (13 ft) after 10 years. Common holly is supplied at a height of 1.0 metres in a 7L container, which means that the tree can be planted any time of the year and with better results than either bare-root or rootballed trees. If you are interested in other variations of Holly then click HOLLY HEDGING for plants starting at 20-40 cm and come in packs of 10, 25 and 100. 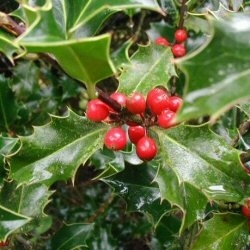 Sexing common Holly trees are not possible until the trees are mature. You would want to know this not because of some voyeuristic hobby but because it is only the female plant that produces berries. If you see a mature Holly tree without any, this will be because it is either a male Holly tree, there has been a long dry spell, over pruning or the tree is not old enough to produce them.